« Stage 5: Belize, Guatemala, and Honduras AKA Operation: Jungle Boogie! 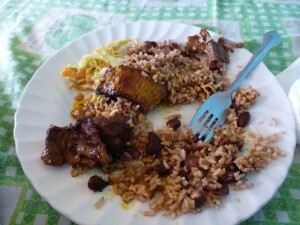 When I entered Belize, the plan was to “skip” the country. 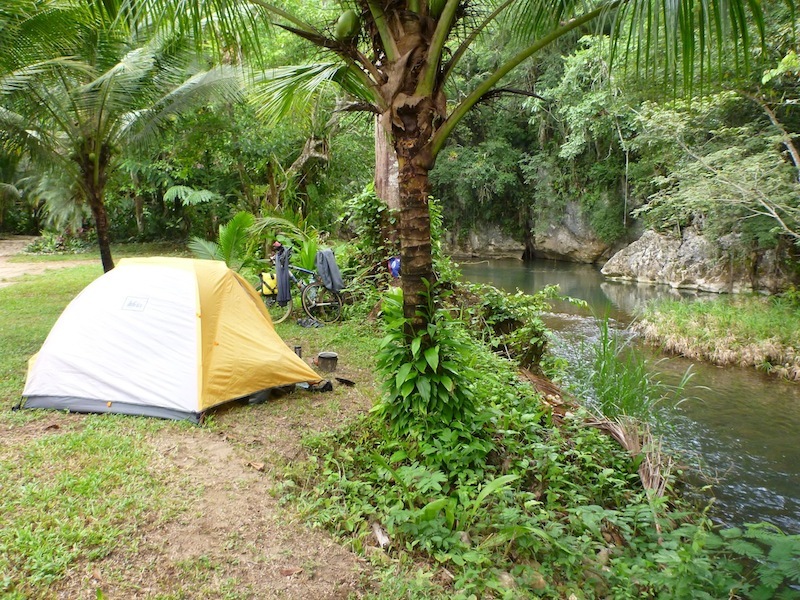 On a trip like this you can never see everything, and Belize seemed unique enough – and expensive enough – to warrant just riding on through it, soaking up what I could along the way. 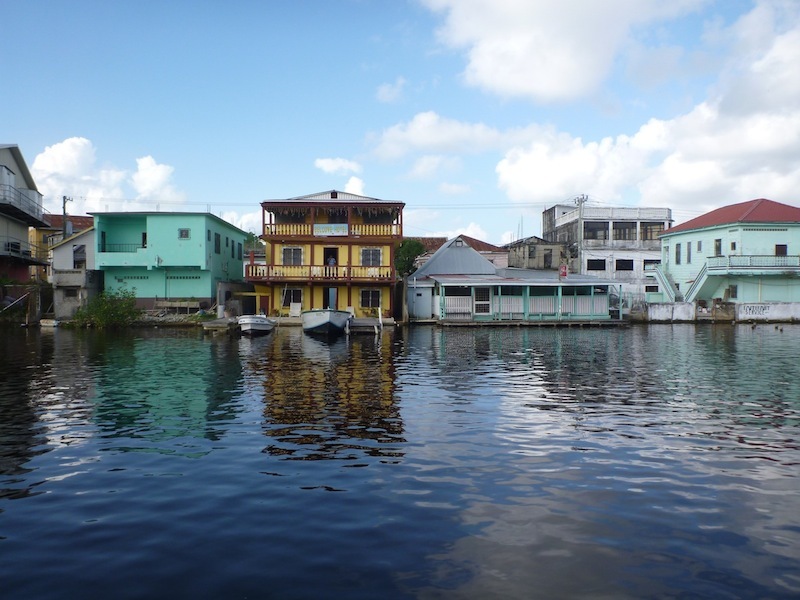 Belize is often described as the “odd one out” in Central America, and for many reasons. They speak English, they haven’t had military coups and civil wars, they have a good reputation for wildlife conservation, and there is a definite Caribbean flair. 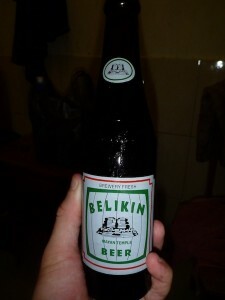 Belize owes it’s unique identity to it’s unique history. Rather than being a Spanish colony it was a pirate haven in the 1600s before becoming a British colony. 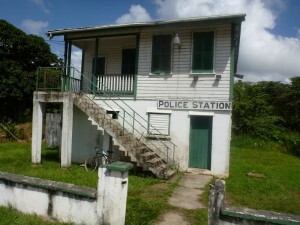 It remained with the British until the 1950s when the first elections were held, though official independence did not come until 1981 when “British Honduras” became the autonomous republic of Belize. It is an incredibly small and young country. In fact, the “founding father” of Belize, George Cadle Price, who was the leader of the first democratically elected party, only passed away last year. His party, the People’s United Party, are now struggling with self-identity in a very politically charge country of just 300,000 people. Those 300,000 people come from all over. Belize peaceful reputation has attract immigrants from all over the world and refugees from the war-torn region surrounding it. First, there are still indigenous Mayan and Garifuna communities, though they are largely outnumbered by the the Spanish speaking Guatemalan mestizos, Mexican mestizos, Honduran mestizos, and El salvadoran mestizos. Next you have the Creole speaking population from African descent – brought over as slaves by the British. Then there is a sizeable Chinese population, most of which have emigrated from Taiwain, followed by a Mennonite population (that’s right, there are a bunch of white guys in denim overalls and straw hats farming in Belize) and a Hindu population. Last but not least, being a tropical, english-speaking country with a currency pegged to the US dollar, Belize has not failed to attract a sizeable US ex-pat population. My first day in Belize, I couldn’t help but feel like I was riding my bike in Guam. It was hot and tropical, the roads were old and slippery, island and reggae music floated out of passing cars, and all the little supermarkets were owned by asians. 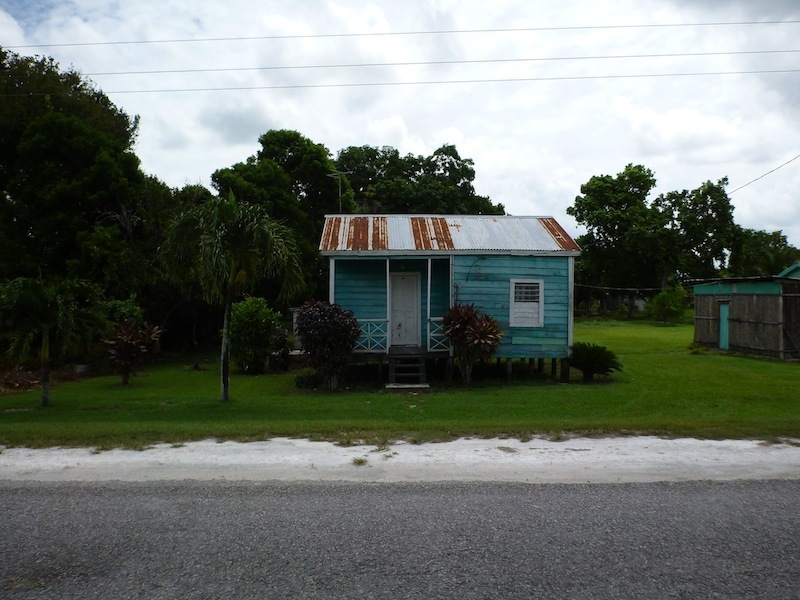 More than that though, there was a distinct island vibe to the place – you could sense that in Belize people moved at a slower pace. 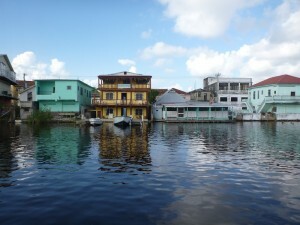 I took three days to make my way to Belize City, a city that still looks like the pirate haven it once was. 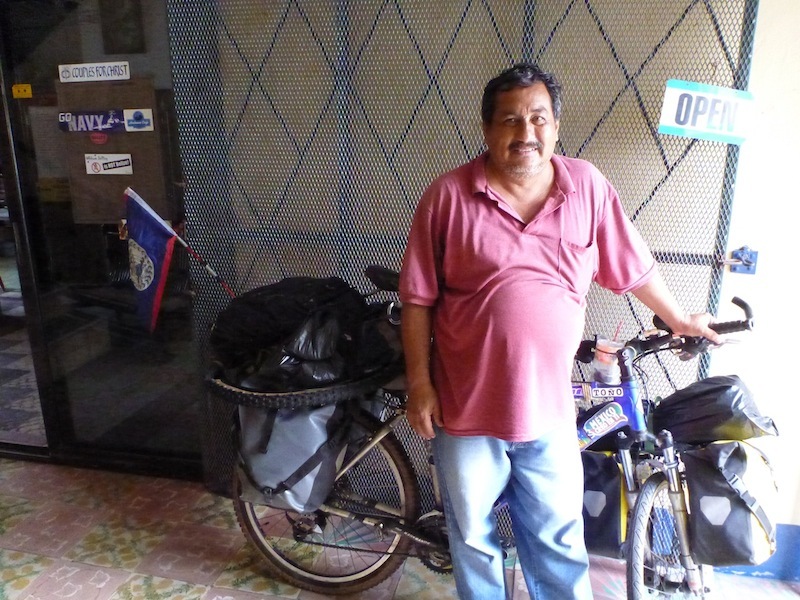 Once there I was lucky enough to meet Jóse, who runs the Smokin’ Balam Guesthouse with his wife. This man is a legend, just an incredibly nice, friendly and interesting guy. I was glad I found him because he was going to have to take care of Tony for me for two weeks while I went to the US for my Grandmother´s funeral and the Not-so-annual Skerritt Family backpacking trip. 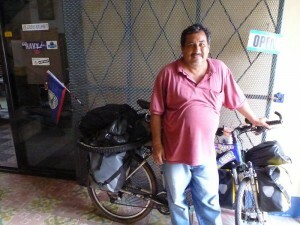 When I arrived back at the airport in Belize after spending two weeks with family in the US, my spirits were high. It felt good to be back in the heat, and it felt good knowing that soon Tony and I would be back on the road to Colombia. No more side trips to Cuba or the US and no more waiting for spare parts to arrive in the post, Tony and I were free to get our heads back into the adventure and crank our way to South America. Back at the Smokin’ Balam Guesthouse I was welcomed in by Jose’s wife, and I didn’t waste anytime in dragging all my equipment upstairs to get everything organised. I had gotten rid of a fair amount of stuff in an attempt to lighten my load for the final three stages of the tour, so I would have to spend some time repacking everything “just-so”. I went at the task with gusto. An hour later, I stood in the middle of a hot, cramped room lit only by a dull flickering flourescent lightbulb, surrounded on all sides by the clutter that had become my life, when I was hit with a sudden and intense wave of loneliness and despair. It felt like hunger, the type of hunger that makes one nauseous, and I could feel it welling up inside me, dragging my tongue back into my throat and trying to coax tears from my eyes. I wanted to cry. No, I wanted to scream. I wanted to curl up into a tiny ball and go to sleep – escape from the world for a moment in my dreams. I took a couple of deep breaths and let out a deep guttural groan. My once cosy room was now suffocating me, I couldn’t breathe. I had to get outside, I had to run. I fled for the door. 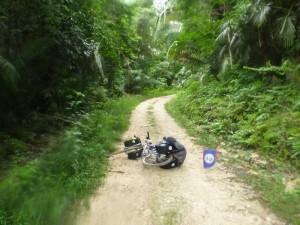 I always manage to find the dirt… On the hilly road to Barton Creek Outpost. Once outside, I regained a bit of internal composure. “Look at the facts”, I said to myself, “this is typical of the situation.” It was typical. I had just left my family for the lonely reality of the road, of course I was feeling the effects. It happened just like this, though not as strong, 5 months earlier when I left my “family” in Guadalajara. It happened just like this 5 years earlier when I got back to a freezing cold Beijing after a similar couple of weeks with the family back then. These feelings were normal, and they would pass. Whilst thinking these thoughts I had wandered into the nearby grocery store. As I blankly browsed the grocery shelves, the feeling of despair did not abate. If anything, it deepened. In that moment I didn’t want to get on that bike again tomorrow, I didn’t want to ride to Colombia, and I didn’t want to travel for 3 to 6 more months. But what choice did I have? Could I just stop here and fly back to Australia now, just halfway through my trip? No, of course not. My pride would never allow it and I knew that it would be a decision I would regret for many years to come. I had come this far, how could I forsake the journey now, just 3 months from the end? How could I deprive myself from the joy of a great and victorious finish!? Knowing that quitting was not an option for me should have helped matters, but it didn’t. In fact, that way the very source of my despair. I was caught in a trap of my own making. I gave up trying to pick out food, and instead I bought beer. Back in my room, the beers helped. 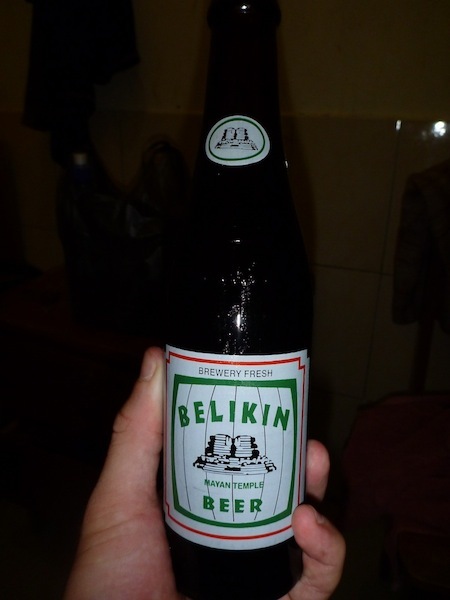 I sat on the floor, leaning back against the wall listening to an english BBC documentary whilst sipping on a Belikin Stout. Slowly I felt that nauseous hunger feeling fade away. My god, I was tired. With my senses dulled slightly by the second beer, I could think clearly again. I cracked open the third, and contemplated the moths flitting about the ceiling of my room. If I was to have any chance of finishing this trip, I thought, I need to keep moving. If I could just keep it together for another 2 months, then I’d be OK. Two more months, and then the close proximity of the finish line would be enough on its own to keep my spirits up and I would be able to cruise in Medellin with a smile on my face. Just take it one day at a time Zack. One day at a time. mmmm beer… Remember kids, beer won´t resolve your problems. But it might make the irresolvable tolerable at least for a little while. The next day I woke up to a sunny morning, and was in a ridiculously good mood. The previous nights events seemed like nothing more than a bad dream. I was going to be alright, I told myself with a big smile of my face. Hours later Tony and I were on the road again heading for Guatemala, and I had a chance to replay the events of the last 12 hours through my head again and again. I felt good today but a voice in the back of my head, like a bruise from last night’s internal rebellion, warned me that this would be difficult and that yesterday’s episode would not be the last. Great to see you and Tonio still on track. Zack our founding father, our National hero is George Cadle Price. Safe travel.